Crimson Tide fans will appreciate receiving this licensed University of Alabama Wall Clock that is made of real wood, is 12" in diameter and comes ready to hang. 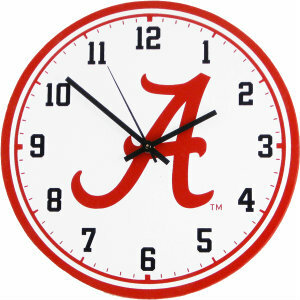 This high quality NCAA Alabama wooden wall clock is meticulously handcrafted by a third party company in the USA. It is not reproduced in a factory setting by machines. This clock should only be hung indoors. The quartz clock runs on one AA battery (battery not included). ON CLEARANCE LIMITED TIME OFFER. Meaning once we sell out of these, they will no longer be available since the sign company who made this clock will no longer do so. ABOUT THIS WOOD WALL CLOCK: The third party wood sign company that makes this wooden wall clock uses top quality materials. Each piece is unique and one of a kind. Therefore on occasion, you may notice a slight color, indentation, perhaps a tiny smudge, scratch or other small variation. These variances & imperfections are not considered manufacturing defects. They are evidence of an original, unique, one of a kind, handcrafted, hand painted piece of artwork created by artisans. Learn more about the quality of these wood signs & how they are made.